Creating a new flooring for a garage or other living space is an exciting opportunity to reinvent the look of a room and its use. As an example, you’ll find some people who realize they don’t need to use their garage for just car storage. 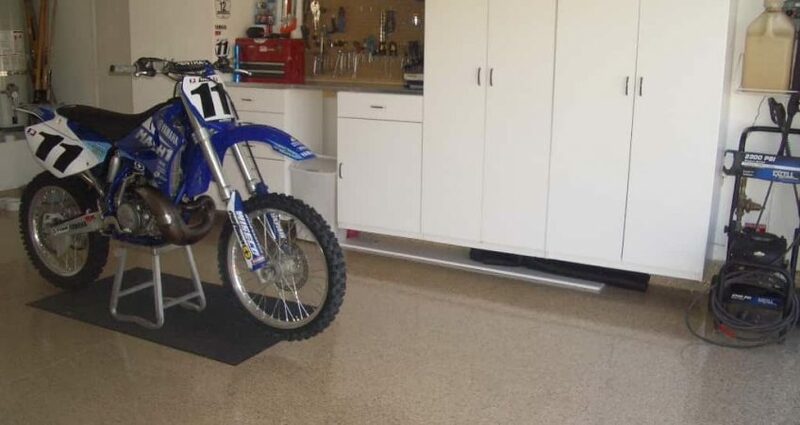 By turning a garage into an entertainment center, you’ll need new flooring in order to accommodate heavy foot traffic. It’s no different for any other room in your house, or even a commercial building. The problem is you may decide to go the cheapest route and merely paint your floor rather than use something more durable. Using paint is the worst thing you can do because it won’t hold up long-term. You’ll have to keep applying new layers of paint once or twice a year. Epoxy flooring systems are the best solution. Here’s some benefits of epoxy flooring systems and why they have more pros than cons. When you want a floor with aesthetic appeal and a professional appearance, epoxy flooring provides it all. After applying a coating, it’s going to turn into a glossy shine that truly stands out. Considering you can customize with different colors and flooring styles, you’ll be able to create something suiting your unique personality. It can turn a garage into an attractive entertainment center without worry about your flooring wearing out immediately. In a business, epoxy flooring brings a true professionalism you can’t find in any other flooring system. Thanks to its smooth surface, you can easily sweep the floor and maintain its appearance. Fortunately, things don’t stick easily to the epoxy surface. To prove how durable epoxy coatings are, it can hold up under some of the worst conditions. The only con is if any moisture becomes trapped under the surface, it may lead to early repair due to bubbling or buckling. However, with an experienced epoxy floor specialist, you won’t get water trapped under the flooring. Epoxy is going to stay resistant overall to any type of chemical. This is one reason so many people use these coatings in garages, as well as in industrial work spaces. The material withstands oil, gas, bleach, or any type of cleanser. Plus, it’s extremely heat and cold resistant, making it ideal if you live in places with recurring inclement weather. A major pro with epoxy is that it’s resistant to bacteria so you can sanitize it easily. Many hospitals use this flooring based on the above feature. Considering many of the benefits, you’re still going to pay less for epoxy flooring than you would any other coating option. One reason it’s so much more affordable is the installation process is a little simpler. All it requires is placement over existing concrete, as well as other floor types. Thanks to fast installation, labor charges are less, though does cost more than paint. Regardless, it’s worth remembering you always get what you pay into, and epoxy is worth the slightly more expense. While one con is you’ll have to replace the epoxy eventually, it won’t happen any time soon. You can count on this flooring holding up for at least a couple of decades, depending on how much floor traffic you have. Basically, you only have to replace it once every generation, and that’s good news for a house or business. You’ll know when to replace it once it shows cracking or peeling. In the end, epoxy helps protect underlying concrete from cracks and stains as well. For a garage, particularly, this is all the more reason to choose epoxy above anything else. Contact us at Pli-Dek Systems to learn about our epoxy floor systems and how these can change the way you use and look at floors in various settings.